Olivia Palermo rarely disappoints with her chic style choices. 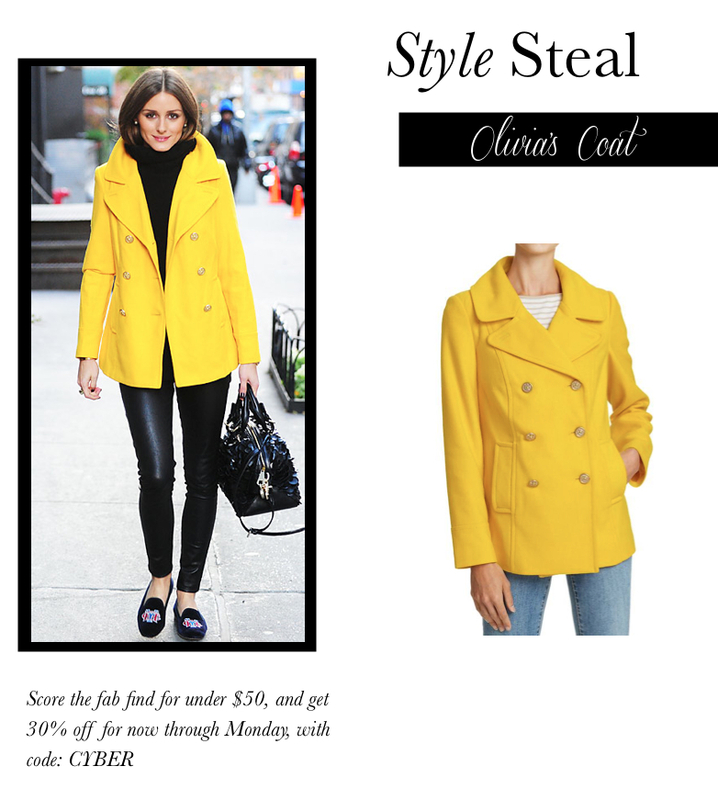 Her sleek black coordinates get a pop of color with her bright yellow peacoat from Old Navy. Get an additional 30% off the budget buy through Monday, making it under $34! Take Advantage of your holiday shopping with Cyber Monday Deals going on now. The Best Makeup Brush Cleaner Ever. – I was in search of an innovative way to clean makeup brushes, that even by using department store brush cleaner, won’t come clean. I found this recipe on Pinterest, but I didn’t have tea tree oil, so I changed it around a bit. It makes your makeup brushes look brand new in seconds! Just swirl brush around in the cup with mixed ingredients. Rinse with hot, then cold water, pat dry excess water & let dry brush side up in a cup. Diptyque ‘Baies’ Scented Candle – This candle is so relaxing and refreshing! It just smells pretty. A new nightstand staple. ShoeMint Hillary Flats – Pointed toe & a bow are one of my favorite combinations right now! So cute. Antioxidant Superfood Smoothie – I’m obsessed with making smoothies with my favorite superfoods. Usually my mid-morning pick me up. Cozy Sleek – Can’t get enough of OP’s urban chic plaid. The excitement of fashion week isn’t only about the upcoming trends. The front row stirs up just the amount of excitement as the runway. One of my favorite attendees, Olivia Palermo, takes the title for “best dressed,” as she breezes through NYFW and LFW in phenomenal style. Aside from the gym, I have never been a sneaker type of girl. But something about the high-top trend has totally drawn me in. The fun-loving style is all about balance. When paired with leather pants, fur vests, and tailored jackets your style will be anything but sporty. This trend is all about fun and comfortability. Spring comes with warmer weather, bright colors and vibrant flowers. A trend that combines all three made me an instant fan. Who doesn’t want to brighten up their wardrobe, after dark-colored hues all Winter? The availability of bright, bold, and pastel palettes, let’s you choose the subtlety of the trend. 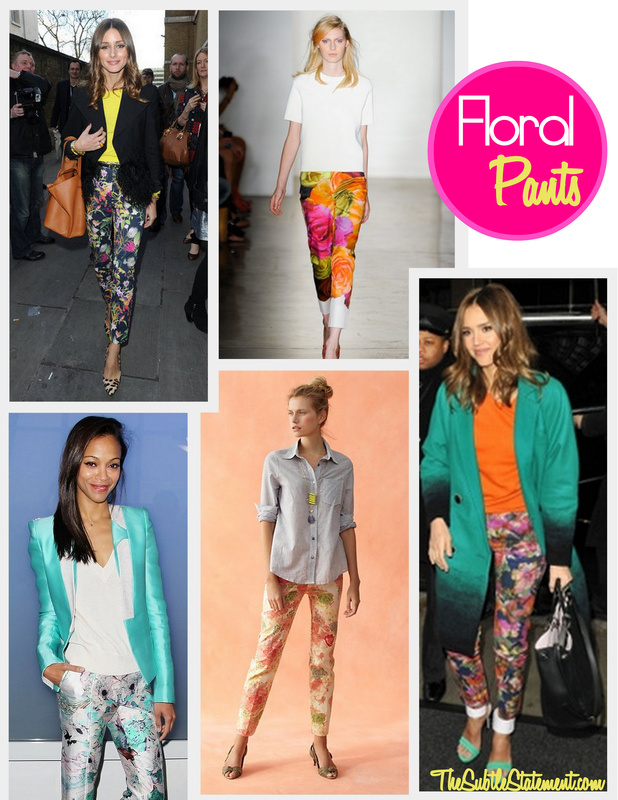 For a subdued version, choose a smaller print. Find your style below by searching ShopStyle. With such a statement item, a solid colored top, and minimal accessories are required.